Like many I had long awaited the replacement of the old Tamiya Grant. When Academy brought out their Lee, a new kit seemed one step closer, and when it came onto the market I acquired one despite all the bad press it had received prior to release. What really sparked the purchase was talking my-self into a group build on SMW and the fact the kit had an interior. The Grant is a much maligned tank, seen as a failure by some. It arrived on the war front really just in the nick of time for the British, and first saw service in North Africa, just prior to the 2nd Battle of El Alamein. Up to that point the British and Commonwealth had simply been out gunned by the more powerful German tanks and in particular their use of the 88mm anti aircraft gun in an anti tank role. The arrival of the Grant didn’t swing the balance but it helped even it out a bit as for the first time they had a weapon in the 75mm that could match the German firepower. Strangely when it first arrived it had no AP rounds, and the tanks was therefore still reliant on the 37mm weapon for anti tank action, but the addition of the 75mm gave great indirect fire support to the infantry attacks. For me the Grant represents that period of transition when armoured development and thinking started to move up a gear and the slow and painful reality of the ‘enemy’ strength in armour was finally getting through to those at the top. Without doubt it had many failings, but it proved a useful weapon and after the British captured a large stock of German AP rounds and converted them to fit the Grant’s 75mm it could pack a serious punch. In South East Asia, it’s height which had been a disadvantaged in the open landscape of North Africa proved to be an asset, and it proved to be highly successful in the campaign against the Japanese. The Academy M3 Grant is the first new 1/35 kit of this model in over 30 years. It had some serious errors and some not so serious ones. The most widely talked about was the incorrect suspension height and although Academy have taken the first steps to correct this error, given that the same problem had been identified in the Lee, well it’s pretty inexcusable that they didn’t correct it in the Grant prior to release. The other major error that turned up was in the 37mm rotor which was cast incorrectly and wouldn’t allow the 37mm gun to depress to the 5/7% it should. The other errors/omissions are somewhat minor. Having designed an interior for the Lee, they didn’t bother to change it for the Grant, so the internal layout of some items was incorrect and others missing. Faults aside I take my hat of to Academy, for producing a much needed replacement for the old Tamiya kit and if as I have recently read they also going to include a new spur to fix the suspension issue that they will have given us a useable and reasonably accurate model to work with. For those who are interested in the ‘rivet’ side of life I would refer you to Terry Ashley’s review over on PMMS which corrects a lot of the misconceptions about the kit and has some useful advice on correcting some of the issues raised above. First nice build Alan. Great job on the beast. A couple of questions. First why did you not go back to Academy they were giving the Suspension parts away? Now charging $8.00 here USA in shipping charges. Second I hate to say but are not the Exhausts in need of changing? If you did discard this as a Alzheimer's thing. I am not sure on the Grant on the Lee I am working they do to be changed. If so Tiger Models has then for $3.50 here anyway but I guess for you across the pond would be $14.00 which I think is a bummer. Here is what I mean by rear end. 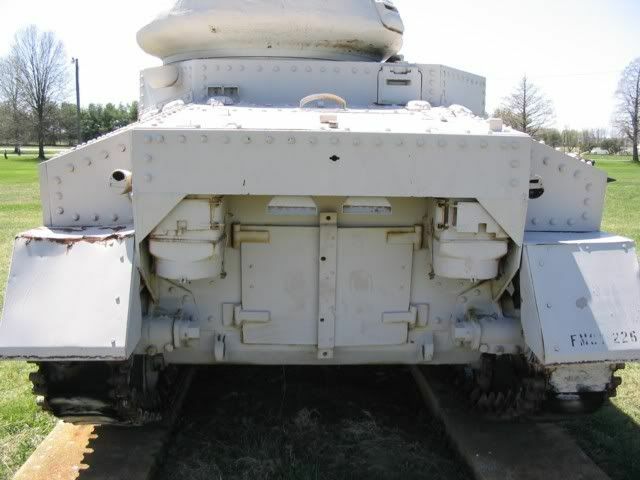 Image from US Army Ordnance Museum And in case you were wondering how they did those Rivets. photo by Wikipedia. 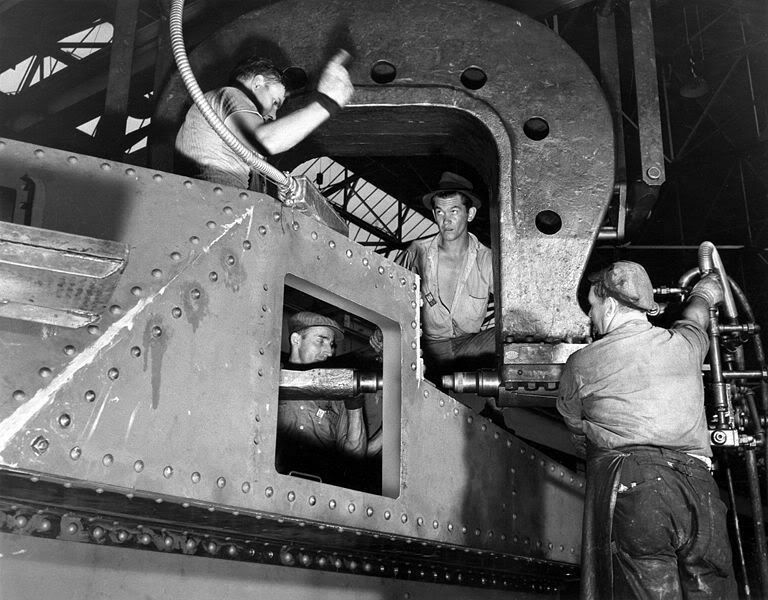 Boy if that was today OSHA would be all over them fellows no eye protection ETC... Looks like they got a little sloppy with that Filler also. Well correcting myself Alan in fact it appears that the British did in fact use the old style of pipes as Displayed on the Grant Monty. So one down and one to go. Good job Mate. Alan do you get the replacement sprue with the kit now or do you have to get it seprately?